Let beauty cast a spell on you. Explore the cultural diversity and surrender yourself to the abode of God. 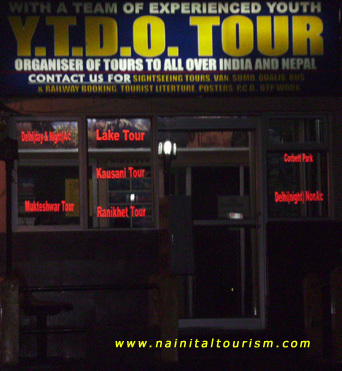 YTDO Tour is one of the oldest Travel Agency of North India - Ranging from the Hills of Kumaon to the Beaches of Kerela. 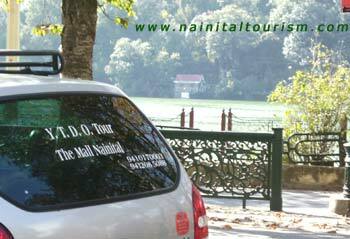 YTDO Tour providing all travel services for Nainital Uttarakhand and India at discounted prices. Travel now made easier with YTDO Tours. Its not profit but your smiles that we earn. Hotel Booking with attractive packages and pocket friendly rates. All India & Nepal tour, car rental & student group booking at an alluring price. The tour covers one of the most exotic places of the Kumaon region. The main destinations of this tour are Almora and Ranikhet with stopovers at Bhowali, Kainchi Ashram, Kalika Temple and Golf Link, which will enchant you with the splendour of their landscapes. Departure ��9:30 a.m. Arrival- 4 p.m. next day. RATES: (Taxi Rs. 4,000/-, Sumo Rs. 5500/-Tavera Rs6500, Only Transport). Situated at the altitude of 2286 metres and 52 km. away from Nainital. Mukteshwar offers a bewitching view of the snowcapped� Himalaya� ,orchards with special stopovers at Bhowali, Ghorakhal Temple, Tea Garden, Ramgarh , Mukteshwar. RATES: Taxi Rs. 2500/-,Sumo Rs. 2800/-Tavera Rs. 3200 Only Transport). Ranikhet , the most famous hill station of Kumaon region, is known as the queen of the hills. One can have the view of the snow-capped Himalaya from here. 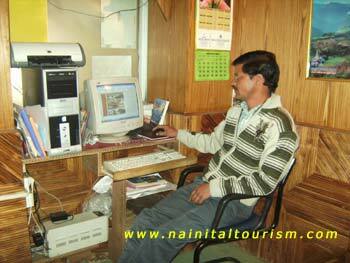 In this tour to Ranikhet, we are likely to see Kainchi Ashram, Kalika Temple, Golflink and Hairakhan Temple. RATES: (Taxi Rs. 2500/-, Sumo Rs. 2800/- Tavera Rs. 32,00/- Only Transport). Munsyari, the fairy land of Kumaon hills, is unique in its beauty and charm. We can have a closer view of Panchachuli range from Munsyari. It is the last bus terminus of Milam Glacier trek. 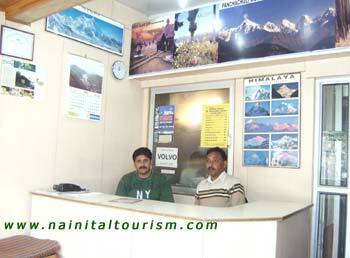 Other stopovers in this tours are Almora, Bageshwar, Chaukori, Thal. RATES: Rate: Taxi Rs. 9000/-, Tavera Rs. 10,000/- (Only Transport). Mahendra Nagar, a border town of Nepal, is just about 150 kms. from Nainital.It is an exciting and unique experience to visit Nepal .One can enjoy the culture of Nepal. Indian citizens do not� require passport and� visa while visiting Nepal. The road to Mahendra Nager passes through� lush green forest ,villages and towns of tarai . On the way, one can visit the Holy Gurudwara of Nankmatta also and enjoy the beauty of river Sharda at Banbasa. RATES: Taxi Rs. 9,000/-, Tavera Rs. 12,000/- (Including, accommodation, taxes of Nepal for four person ). The Lake Tour offers a golden opportunity to enjoy the simple serenity of the area close to Nainital City. Although, the tour is only for half-a-day, it covers several classic places like Bhowali, Bhimtal, Sat Tal, Naukuchiyatal and Hanumangari and hence offers thrill and enjoyment to the tourists. RATES: (Taxi Rs. 2000/-, Tavera Rs. 2500/-Only Transport for half day). Raj Bhawan, Himalya Museum, Cave Garden, Nainital View Point, Himalaya Darshan, Water Fall, Bara Pather, Lover's Point, Pangot (Restaurant facility at hotel Monal). RATES: Full Taxi Rs. 2500/-, Tavera Rs. 3000/- ( Only Transport). RATES: Rate: Rs. 2500/- per seat inclusive of transport, entry fee and jeep safari. RATES: Taxi Rs. 2500/-, Tavera Rs. 3000/- Full day ( Only Transport). Special Packages, Hotel Booking, Trekking , Camping, Railway, Air Ticket Booking, cancellation and Sale of Tourist Literature and Maps. ������������� Nainital A/C no. 2717002100006493. � 1999 - 2018 - OnLine Technologies. All Rights Reserved.